When does art become meaningful? Art is quite subjective. An artwork can raise an emotion or move one person and leave another perplexed. However it may be, we recently had the joy of experiencing a unique moment in the history of envoy where a foundation of friendship and fellowship was cemented with a unique and very meaningful art. After finishing majority of the renovations, we were left with one stretch of wall that seemed empty. This space was calling for something eye catching, something colourful… so the idea of a wall mural started to develop. 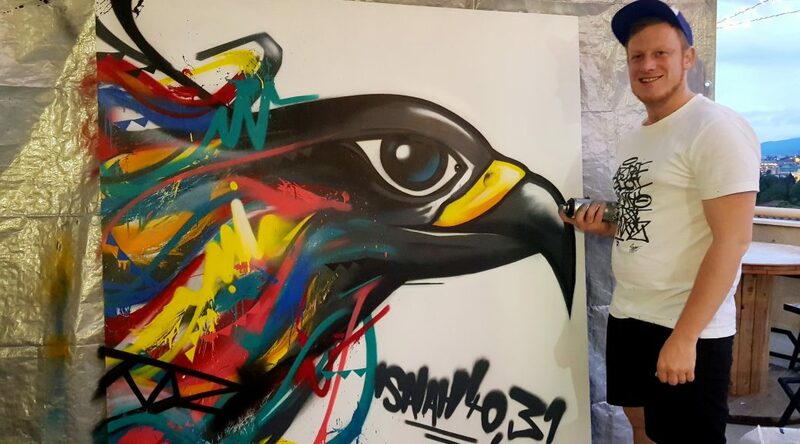 Later that same day the idea had sparked, Dominic, one of our dear guests staying at Envoy as part of a group of German pastors declared that he had had such a blessed time that he wanted to say thanks by creating an artwork for us in the form of graffiti!! You can imagine our surprise and amazement at his suggestion! It was indeed the meeting of minds! In the famous words of Benjamin Franklin “If you fail to plan, you are planning to fail!” So immediately we started to chat and decide how to tackle this project. We had the artist, now we needed a concept, a canvas and of course paint! All this in a tight time frame meant there was no time to be lost. We managed to get all the essentials sorted quickly. We even found professional spray paint in a wide range of colour choices. As far as the concept, we were thinking something inspired by nature. Any project has its challenges! Some you can predict in advance but some you come to face unexpectedly. This project was no exception. First it was the weather that concerned us. The whole day had been sunny and warm but as we started to get ready to do the painting, clouds gathered and rain was imminent. This brought on urgency to ensure our canvas wouldn’t get wet. We decided to lift the canvas to the rooftop to work on it under the covered area to stay dry. As we tried to take our canvas to the rooftop where it was going to be painted and hung, we realised it was going to be trickier than we had thought. It took German ingenuity and a lot of teamwork but we successfully lifted the canvas at last! And so our meaningful art project came to fruition! Dominic skilfully painted as we all watched in amazement. This artwork has so much depth of meaning to us, linking Tbilisi legends and our faith through to a constant reminder of our new formed friendships which we hope will last forever. Thank you Dominic for this beautiful gift we will always cherish. Above all we thank God who lead you and your friendly group to our hostel, gave us the inspiration, motivation and of course talent to create this masterpiece. Praise God for His wonderful ways!